The Boynton Beach area was home to many well-known tourist attractions of the past. Sadly, these roadside stops no longer exist in today’s Boynton Beach. James Melton’s Autorama – Located on US 1 in Hypoluxo, famous tenor James Melton displayed his extensive automobile collection to the public. Muralist Bernard Thomas painted a western themed mural in one of the museum halls. Mr. Melton’s untimely death in 1962 led to the closing of the museum. The property was sold and became a development. Bianca’s Birds – This attraction on US 1 featured performing birds and a mock Seminole Indian village. Guests could dock boats or park on the premises. Later the property became a trailer park, then a residential development. featured citrus shipping, famous apple pies, a train ride through the groves and alligator wrestling and a hammock area with a recreated Seminole Indian village. It is now the Knollwood residential development. Madison’s Jungle Garden – Located on Military Trail north of Gateway Boulevard, this tiny attraction was a rest stop for travelers. Several animals were on display in a small zoo. The Madisons made items to sell to the tourists such as orange blossom perfume, palmetto hats and pepper hot sauce. Palm Beach Groves – Operated for decades by the Shelton Family, this attraction featured a tour of the groves, sausage trees and an extensive store for Florida produce and souvenirs. Its peacock flock survives in the nearby Fox Hollow neighborhood. Rainbow Tropical Gardens – This beautiful garden on US 1 featured beautiful landscaping and lagoons with small fancy buildings throughout the property. The main building is today’s Benvenuto Restaurant, while the back of the property is a residential development. A few of the small garden structures survive on private property. 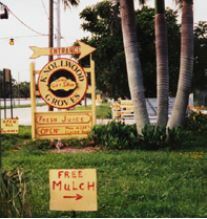 Waite’s Bird Farm – Located on US 1 north of Boynton Beach, this attraction was originally the Lewis Bird Farm. Howard and Angela Waite owned and operated the zoo and pet shop. It featured trained birds, alligators, monkeys and other animals, and birds were raised and sold as pets. The building still stands with a different occupant.